As any parent knows, having young children can often make you feel like you’re in constant negotiations. While they are testing every boundary you’ve set, they don’t realize that you have worked hard to create rules that will keep them safe and secure. Often it can feel like their happiness (and yours!) depends on handling their demands with finesse. But how is a parent to handle the constant power struggles with children? Read on to find out. Kids often first start showing their autonomy around the age of two. It is then that power struggles with children first become an issue. Many parents start out thinking their toddler’s obstinance is cute – the pouty little lips and hands on the hips can be adorable in one so young. But when this becomes the norm, the parents may suddenly lose patience and become annoyed and defensive. The power struggles begin. It is important to realize that this is a normal part of a child’s development, and it is vital that we encourage their independence whenever possible. Instead of fighting them, let them know that you are proud of their abilities to think and act for themselves. Give them a sense of ownership over their bodies and minds so that they feel empowered to make decisions some of the time. It is very easy for us to be drawn into a showdown with our kids when we feel they are picking a fight. Our instinct is to immediately show them who is boss, stomping our feet and insisting that they do what we say immediately. But when we engage in power struggles with children, we are showing them that their bad behavior works. A much better idea is to redirect their attention. Do not engage in negative discussion. Instead, keep the conversation going in a positive way. For instance, bed time can be a true power struggle when you ask your child if he is ready for bed. He may engage in shouting, hitting or crying, which can be frustrating for the parent. Instead of yelling or insisting that it is bed time, redirect the conversation in a positive direction. “Have you brushed your teeth? Can I get you a glass of water? Do you want me to carry you? Which teddy bear do you want tonight?” These are all great redirection questions to ask your child and get him concentrated on individual tasks that lead him toward the outcome you expect. In the same vein as redirection, one of the best things you can do to end power struggles with children is to offer them a set of choices. This can require a bit of thought, but once you get used to doing it, it is much easier to think on your feet. Instead of telling your child to simply go to bed, which gives them something to fight against, offer them two choices which both lead to the same outcome. “Do you want mommy to put you to bed, or do you want daddy tonight?” When a child is craving autonomy, they welcome the chance to make a choice instead of follow an order. Children really enjoy feeling helpful. They crave positive reinforcement, and a lot of their bad behavior comes from a place of wanting to prove worthy. Starting from a very early age, it is vital to give them a sense of accomplishment, allowing them to be useful. As parents, we know our kids take three times as long to get things done, and it’s easy to lose patience and want to do everything yourself. But when time allows, it can be incredibly beneficial to allow children to take the reins on some things. A great way to do this is to make them “the boss.”. Each of my children has gone through a phase of rebelling against their seat belts. When that stage hits, I’ve learned that I can help them the most by giving them power over car safety. At that point, I make them the boss of everyone’s seat belts. They get to check everyone else is buckled in safely before putting on their own seat belt. When a child takes pride in a job well done, they are much more obliging to their parents. If you want your children to truly respect you and the rules of the home, it is important to know the difference between Authentic Power and Coercive Power. Power struggles with children often come about because the adult is engaging in coercive power, which judges behavior as “bad” or “wrong” and uses force, threats and guilt to guide the child toward an action. Authentic power, on on the other hand, requires the authority figure to work with the child to find ways to positively reinforce love and acceptance no matter what. It offers the chance to converse with the child using reason and logic so that both come to the right decision. The danger of coercive power is that it works really well in the short term. It is an easy position for a parent to take, as it offers no room for negotiation. However, it can and often does lead to the child feeling powerless, which can lead to them wanting revenge or acting out in ways that put themselves in danger. Work on creating dialogue and developing an authentic power, and you will find your children respecting you and your rules more genuinely. Have you ever found yourself nagging your child to do something? Whether it’s cleaning their room, taking out the garbage or calling their grandmother, we often make our kids deaf to our requests because we are reminding them again and again of things needing done. For kids, especially older kids, they lack any sense of urgency about a task. The garbage man doesn’t come until morning, so your teenager doesn’t get why you’ve been begging him to take out the garbage since 3PM. This ignites his defense mechanisms and you suddenly find yourself engaged in a power struggle. He wants to finish watching his favorite show first, but you want to get the kitchen cleaned up before bed. You can talk and talk and talk about things, and each of you will feel you’re right. Instead, use friendly actions to make your point. Grab up the bag of garbage and place it next to him on the couch. Go on with cleaning the kitchen, a smile on your face. Perhaps sitting next to a stinking bag of garbage will prompt him to action right away. If not, at least it is in his line of sight to remind him that it needs done. Positive reinforcement is really the key to ending power struggles with children. If they feel respected and valued, they are more respectful to their parents. Besides the obvious way of telling your child you love them often, there are many ways to show that you respect their opinions. Ask them for their opinions on your clothing or hair. Give them the chance to help with meal planning or grocery shopping. Ask them to teach you how to play a game, or engage them in conversation about their favorite YouTube channel. Consistently show them that you value them as a person. If you grew up in a “my way or the highway” type home, it can be easy to carry on that mentality with your own children. Many of us find that we are immediately defensive when our kids question our rules. Similarly, many of us are so tired of the constant power struggles with children that we end up giving in and letting them have their way, as it is the easiest thing to do. There is a middle ground, of course. When your kids are pushing back against a decision, try being open and honest with them and finding a way where both of you benefit. Perhaps your daughter doesn’t want to do the dishes – it messes with her manicure, and she’s upset at the idea. Offer instead to do the dishes yourself while she handles sweeping and mopping the floors. The work still gets done, and no one’s manicure is ruined. One of the biggest power struggles with children is when they want a rule changed because they think they deserve it. Bed time is prime example. Kids want to stay up later, but often it is the parent that suffers when the child has trouble waking up in the morning. If your kid wants a rule changed, discuss with them the reservations you have about it and set some basic goals that you can both agree on. Ask some easy questions including how will you both know it is working (he still gets up at the same time in the morning), how will you both know it is not working (he now struggles to wake up in the morning), what will you do if it isn’t working (revert to previous bed time), and what will you do if it is working (continue with the new bed time). Your child now knows that the new rule is dependent on their behavior and its effect on the rest of the family. It gives a concrete expectation for both of you so that there is an easy way to judge whether the rule is a success or not. It is also important to remind the child that just because it isn’t working right now doesn’t mean it never will. Give them a timescale for trying again so that they are more likely to respect the status quo. At the end of the day, power struggles with children are a reality for every parent. But with the implementation of just a few of these tips, you can find yourself raising more respectful kids who are more willing to think logically about the reasons you do the things you do. When each side respects the other, conversations can replace negotiations, and the parent-child relationship will thrive. 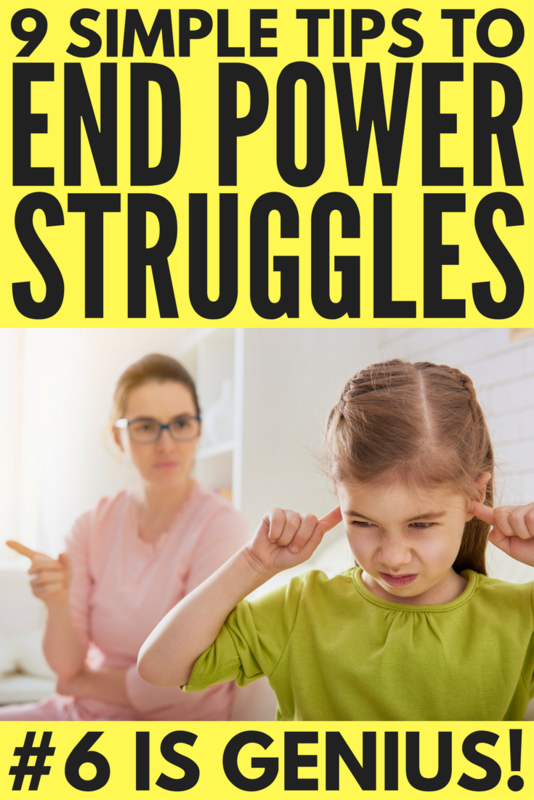 If you found these tips to end power struggles with children helpful, please share it on Pinterest!